Archibald Clare, mentath in the service of Britannia, is about his usual business – solving crimes and restoring public order until a shattering accident places him in the care of Emma Bannon, sorceress Prime, who once served…and now simply remains at home, tending her solarium in reasonably quiet contentment. What Clare needs now is time to recover, and not so incidentally, a measure of calm to repair his faculties of Logic and Reason. Without them, he is not his best. One could even say that without them, he is not even properly a mentath at all. Unfortunately, calm and rest will not be found. There is a killer hiding in the sorcerous steam-hells of Londinium, stalking the Eastron End and unseaming poor women of a certain reputation. A handful of drabs murdered on cold autumn nights would make no difference…but the killings echo in the highest circles possible, and threaten to bring the entire edifice of Empire down in smoking ruins. I would’t necessarily call this a great series, but I enjoy reading it – ’cause good romps are hard to find. With The Ripper Affair, we return to the magic and muck of Londinum, as Bannon and Clare take on another dastardly case – only this time, their partnership is strained like never before. And without question, that strain was my favorite part of this third installment, as a loss threatens not only their friendship, but Clare’s mental stability as well (for Mentaths, in this world, must lock all emotions away, lest they go mad with Irrationality). And I found it fascinating to watch Clare, a man with no understanding of, or method for dealing with, emotions, be barraged by illogical feelings to the point that he strikes out mindlessly in pain, childlike, without ever truly understanding why he’s doing it. And of course, the target of those attacks was the person closest to him, Bannon herself – and watching Clare hurt her, watching their friendship tear and crack, added a wonderful tension to this story, as I really didn’t know if they were going to survive it, or if this was truly the last case for Bannon and Clare. And that, that made this book, for me – because I really, really liked not knowing how their story was going to end. But as for the nuts and bolts of the plot, the reverberations from the last book are still very much in evidence, as the rift between Bannon and her Queen is greater than ever – and again, I really liked how that fissure brought an additional layer of emotional strain to the proceedings, as Emma struggles with her hurt and pride even as the Queen comes to her door, asking for help, despite the fact she all but threw Emma’s loyalty away. And so altogether there were a bevy of dark emotions seething beneath the surface, even before Bannon and Clare took on the case – and that case of course centers on a series of particularly grotesque murders, based in part on the real-life Jack the Ripper killings (as you could probably guess from the title). And so, while as far as mysteries go, I do think this case was rather on the Lite side – there was less detecting, more falling-in-the-lap, than I would have liked – I still very much enjoyed the chance to once again travel the streets of this world, from the oozing creep of Whitechapel to the crowded halls of justice, as our pair uncovers a particularly macabre series of horrors. Frankly I just love the sheer inventiveness, the undeniable originality Saintcrow employs within her world, such that while all this is clearly in part a love-letter to Holmesian cannon, it still very much stands on its own two feet, as there is plenty to this story of magic and mayhem that you definitely haven’t seen before. And again, that I really, really like. And yet I’m also the first to admit that, plot-wise, both this book and the series as a whole are not altogether satisfying. The world-building and partnership (gloriously romance free, I might add) are marvelous, but in terms of hanging chads and loose ends, well, there’s a lot left twisting in the breeze at the end of this book – particular when it comes it Mikal and his strange breed of magic – and given this is book three, those holes are really starting to glare. Plus, in terms of A to B plot mechanics, well, things tend to hop out of left field, or magically appear, in ways that feel decidedly un-earned and convenient – particularly when it came to the grand finale. And while the mise-en-scene was interesting enough to keep me fully engaged, I still could have wished for a bit more supporting plot structure – and as is, I feel the plot would unravel rather easily if I sat and thought about it too much. But happily, I was never bored enough to mentally tug at any of those loose ends – I was too caught up by the spectacle – and so all in all, I was able to go along for the ride and enjoy the show. But in order to do so, you really do have to let a fair bit go. Still in the end I was entertained, if not entirely satisfied, by this book – as I always seem to be by this series – and it was more than enough to keep me willing to read more. The magic system is fascinating, the alternate-history London a delightful convergence of science and magic, and I continue to enjoy the brusque yet oh-so-proper partnership between Bannon and Clare – a true partnership of equals, firmly set upon un-romantic footing, which let’s face it, is something we almost never, ever get to see between a man and a woman. And so this is not a book without fault, but it did draw me in and effortlessly entertain me. And that is good enough for me. To be honest,The Ripper Affair is a diverting popcorn read: messy, granular, and inclined to leave distracting bits clinging to your hair. It’s not deep, and at times it’s downright annoying – but mostly it’s satisfying fun. 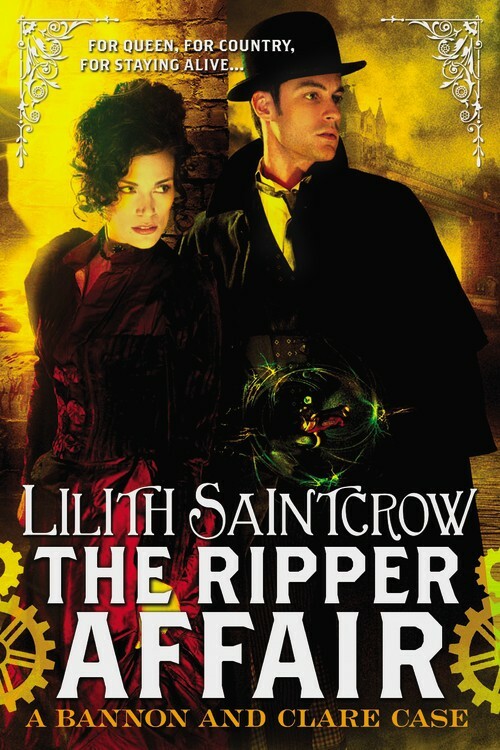 Part history, part steampunk, laced with magic and a healthy dose of Manners, this fantasy may evoke a certain bloody Jack, but Saintcrow takes as many liberties with that story as she does with the rest of her uniquely fascinating setting. The layers of subtext run deep as the heroes say everything but what’s truly on their minds, but at times the complicated dance of emotions and restraint feels too leisurely and indirect.